July is well and truly over now, and daily life continues on. We made a lot of changes in July — will they stick? Were they enough to ensure our month truly was plastic-free? Changes mean thinking, and thinking takes extra effort. So where possible, I naturally try to come up with a good choice once, then just keep repeating it. Therefore after a month of living plastic free, the path of least resistance should simply be to keep repeating it! That’s been my aim for July all along: to make lasting change by working on each of our daily habits. It wasn’t about going cold turkey, which would lead to frustration and probably not even last a month. Instead it’s about changing the impact our lives are having, both now and for the many years to come. In fact, my honest intention was mainly to be a model, to get those around me thinking about what they need to do. This helped keep us things in perspective and not beat ourselves up so much when we made mistakes. We had started asking this question some time ago, but when you have to deliberate it every day, it takes up a lot more mental and emotional energy. But I think it’s a really important question, one that should be asked much earlier on than bin night. It should be considered by everyone (especially manufacturers, distributors and retailers). However it’s a question that’s so easy to avoid when there is an established system to regularly truck every piece of rubbish out of sight. But by holding on to all of our plastic waste for a month, we were forced to face it. And even after so much work, we were surprised to see how much there was! A month can be a long time. Towards end of the month I helped a neighbour who was locked out get back into their house. They rewarded me the next day with a box of Cadbury Favourites. Of course it’s a pretty standard gift and let me tell you I was very happy to get it. But.. look at how much packaging there is inside — none of it even recyclable! Oh no!! At the end of the month we sat down and emptied out the tub to see what was inside. I’d gladly take you through each item, but suspect neither you or I have the patience. 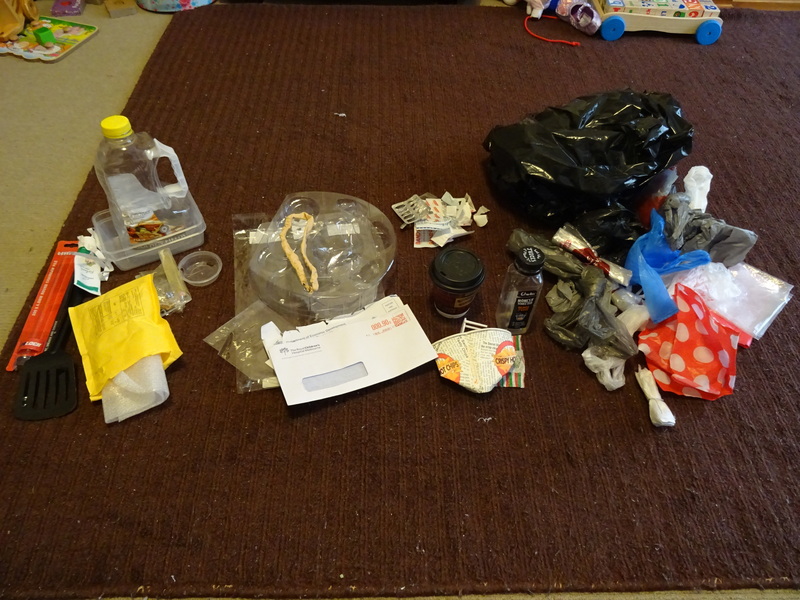 Instead, lets look at the broad categories we made, from left to right: Household items (broken, or related to repairs), gifts or mail sent to us, medical-related, food and drink, and plastic bags (all of which were given to us). Broken items were something I hadn’t really thought about before. 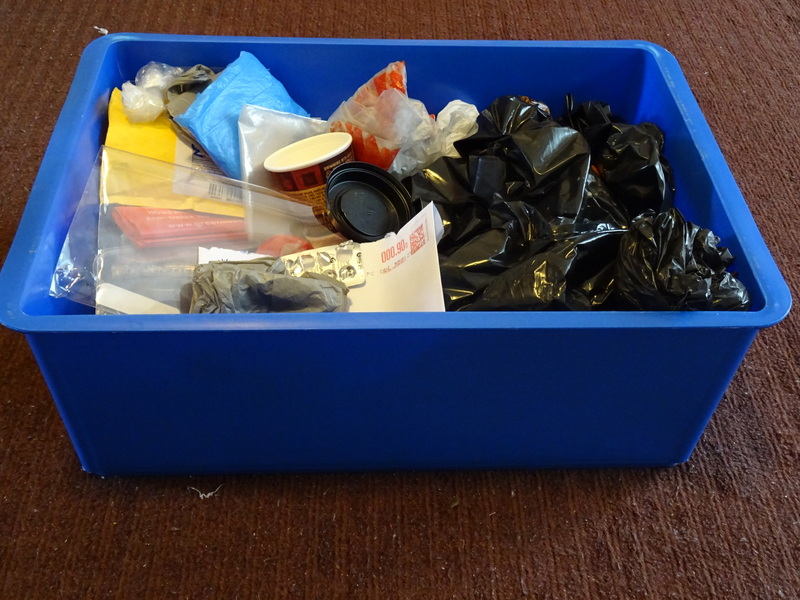 These were certainly not single-use (plastic containers could be, but believe me we gave them plenty of uses! ), yet the plastic still needs to be dealt with eventually. Thankfully recycling is available — this is what recycling is for! It was also a great reminder to choose new products wisely and look after them to ensure they last. Mail and other items given to us are generally out of our control. Or are they? In June we ended up with several envelopes with plastic windows, so we redoubled our efforts unsubscribing from mail-outs (in what seems to be a never-ending challenge) and opting for email delivery. But even so, there will always be new reasons for mail to be sent to us. Apart from plastic bags, we received very little other gifts with plastic packaging. Which is pretty amazing considering my birthday was in July! By talking about the Plastic Free July challenge we had hoped that people will consider our position when buying us gifts, and it seems to have worked. As a bonus it’s another sneaky way to get other people to participate in the challenge! Medical items seem impossible to avoid. So we won’t even bother going there. Considering all the food and drink we consumed over a month, I’m pretty happy with this tiny pile! Still, the few items there seem obvious, I guess it just shows unless you’re relentlessly focused on avoiding plastic, it finds its way in. Consider a paper cup of hot chips: at first glance it seems perfect, until you look closer and realise it has a plastic lining. And almost every piece of fruit we bought has a little plastic sticker on it. Presumably this is to hide blemishes more than anything — do I really need to be told that a green apple is a Granny Smith? Plastic bags: well it just goes to show how entrenched they are in our society. Even when we were trying our hardest to be prepared and avoid situations where we’d need them, we were still handed them numerous times. We usually wash and re-use any type of plastic bag, for example at the bakery for a new loaf of bread. But we are growing weary of dealing with all this plastic and are finding alternatives for more and more things. We now have five homemade cloth bags for our bread which are working great. After going through it together, my wife and I discussed if we could realistically aim to reduce this pile to nothing. We agreed that some things would be staying. We’ll keep using band-aids, pain-killers and prescribed medication. I needed to fix that broken window blind and if that meant ordering a part to be shipped in bubble-wrap from Hong Kong, then so be it. There’s no way we would have taken that cute balloon dog away from our daughter, and that bucket of hot chips? It was totally worth it. We had to come up with so many alternatives for our daily lives, and feel like we’ve achieved so much. Look out for a future post with a complete list of plastic-free alternatives for every household product. One thing we learnt was to savour the old ways of doing things (for example making a cup of tea or cooking a meal from raw ingredients), which are more satisfying in the end. 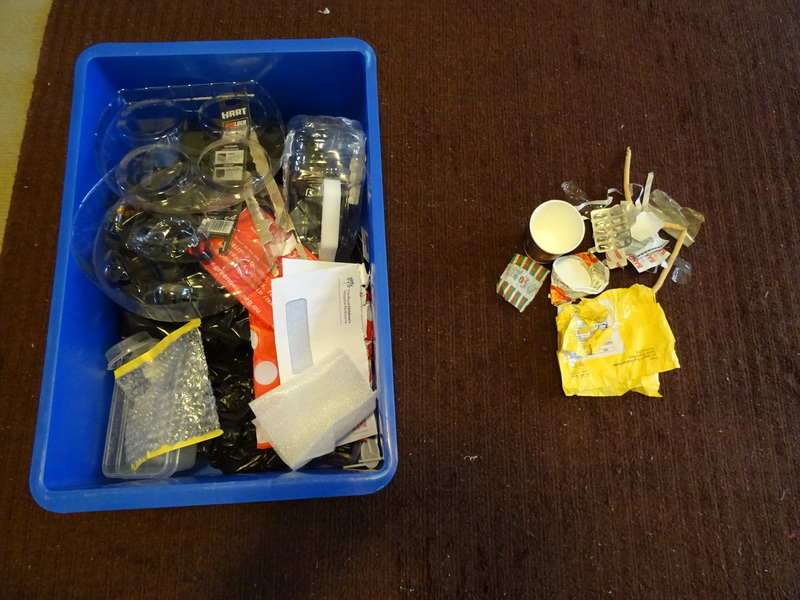 As I’ve alluded, we also learnt that plastic is in more places than you might expect! We were particularly challenged by packaging made with a mix of materials (plastic, foil, paper). Things such as milk cartons are labelled as recyclable, but they require specialised facilities and more energy to process, which now makes us think twice. We realised just how much we don’t know about how recycling works, and still have many unanswered questions. We hope to go on a tour of a recycling plant one day, but so far haven’t had the time to organise one. We still have a glass milk jar in the fridge, but next to it is a plastic one that was picked up out of convenience. I’d like to continue reusing our glass jars, but don’t always have enough time to go on my way home from work. And we revisit the question of conventional milk vs organic or biodynamic, not to mention all the others2. Oh man, choices are hard. 1 Don’t get me wrong, I wouldn’t buy them myself, as I was acutely aware of the irresponsible packaging and my own hypocrisy as I peeled open each and every one. Each and every delicious, mouth-watering one. 2 One day I’d like to blog about them all, and look at the question of how to weigh up multiple values. Just in thinking about milk (and dairy), where it comes from and how it gets here, and I can pick several issues. I’d love to be able to come up with a formula to quantify them and make a calculated decision. I’ll blog about that one day..